Does the idea of hosting a holiday stress you out? Don’t worry my friends, I’m here to show you today how you can create a delicious, stress-free Easter Menu that won’t break your bank! If this sounds too good to be true, then I’m willing to bet you haven’t been introduced to ALDI yet, have you? Well, first things first, take a peek at the post I wrote a little while back about the hidden gem that is ALDI.. I promise you, a quick read that will leave you searching for the closest store to you in no time! Now that we have those bases covered, let’s chat your Easter Menu. Whether or not you’re hosting this year, I’m willing to bet you’ve been tasked with bringing a little something to share if you’re not creating the whole menu. 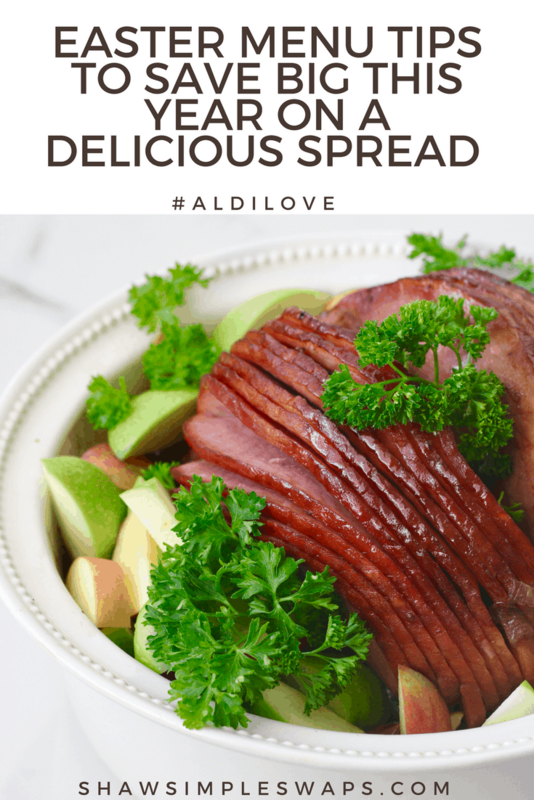 Before you sink your time into the endless hours you may spend trying to find the perfect Easter dessert, side dish or glaze for your ham, do yourself a favor and just head straight to the delicious recipe collection created by ALDI chefs! Trust me, I had the opportunity to dine with these chefs first hand in Chicago (the headquarters of the ALDI USA) and I’m not kidding when I say their food tasted just as good as the infamous Jake’s of Del Mar! If you’re overwhelmed by the delicious photos on their site, let me make a few recommendations for you based on what I whipped up for my recent appearance with the ABC San Diego! You’ll notice I’ve never posted a ham recipe here from the Shaw Kitchen because truthfully, I rarely eat pork. But, this will be changing now (thanks in part to baby’s hormonal effect on my eating habits!) 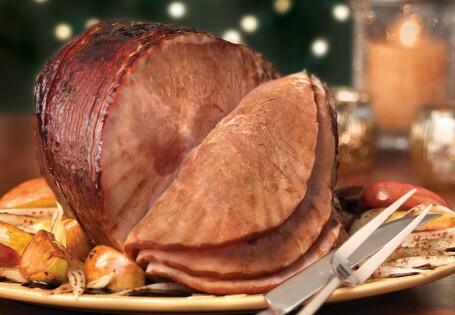 and boy am I glad I ventured off into the ham side with this choice. The level of flavor took this eating experience to a whole new level, and what’s even better is that every Wednesday, ALDI offers incredible Weekly Fresh Meat Specials! When you see the “Weekly Fresh Meat Special” sign, you’ll find extra-low prices on the very best cuts of meat. Love a good veggie side dish but concerned if ALDI carries organic. Well, you’re in luck because ALDI continues to expand their offering of organic products! Shoppers can spot organic products by the “organic” seal on the front of packaging and in this dish alone, I picked up nearly 50% of organic produce to use! And, don’t fret if you can’t find all organic. Here’s a quick reminder on the facts behind conventional versus organic produce! If you’re more of a traditionalist, then I highly recommend this Carrot Cake from ALDI. ALDI offers a wide selection of baking essentials, such as Baker’s Corner Powdered Sugar, Flour and Baking Powder. If you’re in the mood to whip up something made with love and from scratch, this is a must! If you’re planning on putting together an Easter basket, you can find everything at ALDI. You can include items like Choceur Premium Chocolate Easter Bunny, Huntington Home Colorful Easter Egg & Grass Assortment or even assorted toys! These items will be in stores as ALDI Finds while supplies last, so be sure to find the ALDI closest to you FAST! Can’t seem to find an ALDI in your area just quite yet? Don’t worry! ALDI recently announced a $3.4 billion capital investment to expand to 2,500 stores nationwide by the end of 2022. The expansion will make ALDI the third largest grocery store by count in the U.S.! 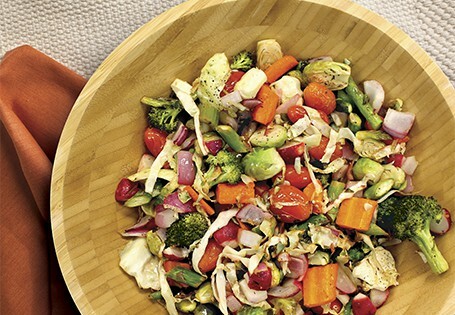 Visit aldi.us to take advantage of better-for-you and clean recipes so you can make fresh food fast at home. Cheers to a fabulous Easter my friends, and be sure to let me know in the comments below what you’re whipping up this year! 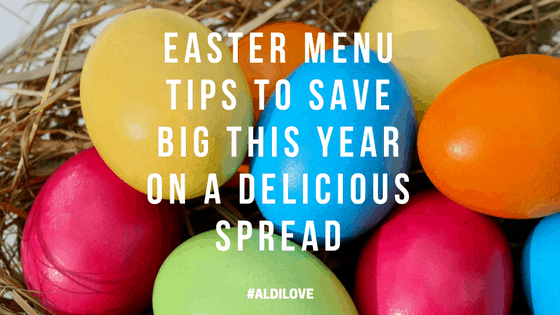 For more fun information and tips, “Like” ALDI USA on Facebook and follow @ALDIUSA on Instagram and @ALDIUSA Twitter. And, if you’re like me and want to share your own recipes, photos, tips, and tricks, tag ALDI using the hashtag #ALDILove. Happy Easter!! Thanks for all the tips! We don’t have Aldi in Canada but sounds like a great place to shop. Oh gosh! Maybe one day ALDI will venture more north! This seems like a great Easter menu, espcially the carrot cake… #sorrynotsorry I’m obsessed with cakes ? and my hubby too. ME too!! 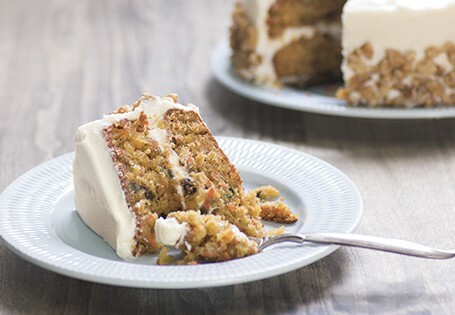 I love carrot cake anything! Absolutely Sarah, my door is always open for you! I love when I meet fellow ALDI lovers! Oh how I wish they had more ALDI stores out west. I’ve lived in several cities, and never an ALDI. I’ll keep holding out! They’re expanding in the next few years too! I will cross my fingers one lands in your home town! This all sounds so delicious! Those lemon herb roasted vegetables are calling my name. They sound so refreshing! Hands down one of the most enjoyable recipes I’ve ever made with produce! This menu looks amazing! Although I don’t have an ALDI in my state, I love they have these recipes online! I’ll cross my fingers you get one soon! Thanks Lauren! I wish you did too! 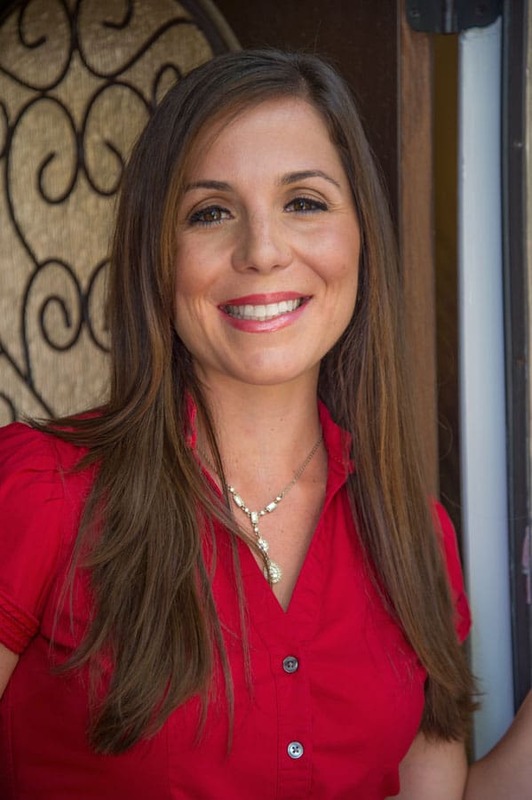 Love tips for saving money at the grocery store! And ALDI has some amazing deals! Totally! They are the best when it comes to saving big! These are great tips and ideas. Lol about eating ham now! Been there–> though for me it was iced oatmeal cookies. Ha ha. Oh yum! I love a good iced oatmeal cookie! Yum, it all looks so good! And that carrot cake! Oh my!! !